Once the performance framework is in place, the next step is to identify performance indicators that will enable users of the information to assess what the organisation has achieved and whether it achieved what it intended. Organisations need to weigh up the costs and benefits of potential indicators. As well as needing to be useful, meaningful, and reliable, it's important not to swamp the reader with too many indicators - it's about the right measures, not the number of them. Finding reliable indicators for the impacts and/or outcomes of services can be challenging. Also, these indicators may be affected by a range of factors external to the organisation. Supporting the indicators with good commentary can help address any weaknesses with them. The indicators for service delivery should cover the main dimensions of performance, which commonly include quality, quantity, and timeliness. Importantly, they should also cover the costs of delivering the services. Applying the SMART approach to service delivery performance indicators and their standards (or targets) can be useful – that they are specific, measurable, attributable, realistic, and time-bound. Another useful approach is the FABRIC framework: performance information should be focused, appropriate, balanced, robust, integrated, and cost-effective. 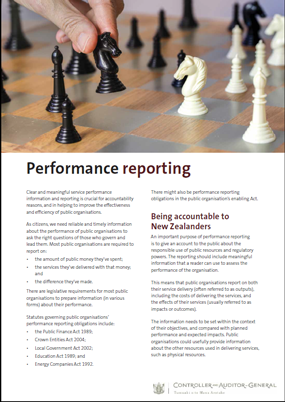 It can sometimes be useful for organisations to supplement their reporting against performance indicators with case studies.